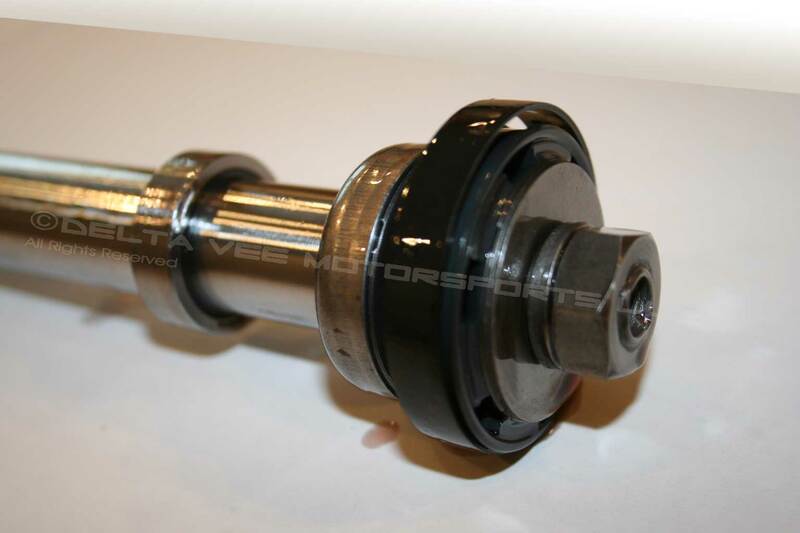 We rebuild the rear load-leveling shocks found on Ferrari 456‘s; the system co-developed by Ferrari and Bilstein. It’s a unique application in that one unit performs both the load level function, also dampens motion like a conventional shock absorber and has the Ferrari-Bilstein active damping system found on other Ferrari (and Corvette) applications from the 1990’s. They’re both hydraulic rams and motion dampers just as any conventional shock dampens motion. They’re rams in that the entire shock is completely filled with hydraulic fluid (you can use Dexron IV) and increased hydraulic pressure creates a lifting force all whilst the unit continues to act as a shock absorber (damper). It’s the lifting force requirement that causes these units to utilize a 22mm shock rod in comparison to the “normal” 14mm Bilstein shock rod. They are shocks in that there’s a conventional shock piston and deflected disc system along with the damping adjuster unit just like you find on the front 456 shock (and F355, Mondial T and 550). 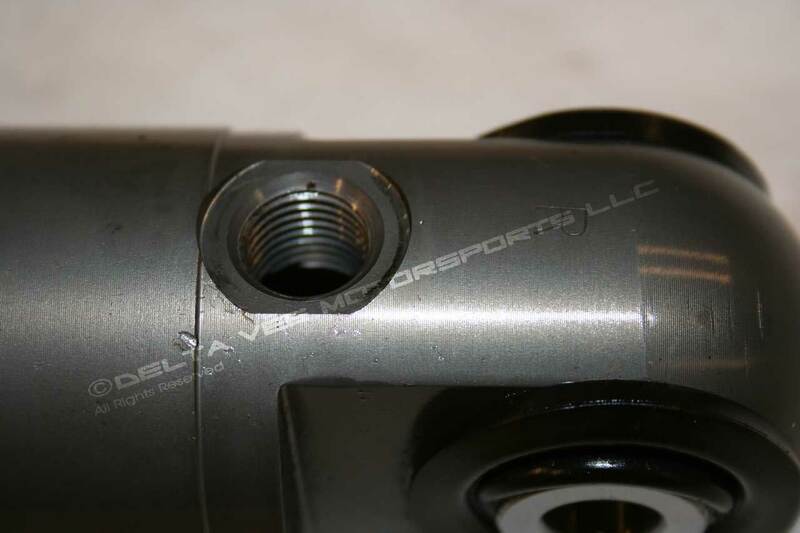 Since the unit is completely filled with fluid when the suspension moves in bump/ jounce the 22mm piston rod displaces fluid as it moves into the shock tube. In a conventional damper by Bilstein this fluid displacement is accommodated by a nitrogen-filled chamber on one end of the shock, separated from the hydraulic fluid by a floating piston within the shock body. In the load level shock, this fluid displacement is accommodated by the hydraulic accumulator units (aka “bombs”) that are located under chassis and connected via a high-pressure hose. The accumulator is pre-filled with nitrogen and has an internal bladder separating hydraulic fluid from the nitrogen. Nitrogen is compressible and the displaced fluid from the shock is accepted in the accumulator. When the flexible bladder fails the system hydro-locks and will result in exploded shock bodies. 2016 UPDATE: We’re seeing a huge increase in exploded load level shocks; you should REPLACE YOUR ACCUMULATORS as soon as possible, unless certain that they have been replaced in the last few years. The hydraulic accumulators do add a spring-like effect akin to an air spring but that’s a secondary characteristic. The helical coil-over spring is indeed the mainspring, though it’s tuned on the soft side and works in tandem with the “ram” effect of the hydraulic system. Indeed the hydraulic accumulators can and do go bad; if you have a rough ride then the accumulator’s bladder has ruptured and you have hydro-locked shocks. 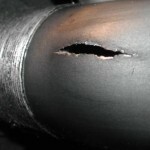 Much more common is micro-scratches in the shock rods, causing the fluid to leak. You’ll not notice any degradation in ride quality with this failure but your garage floor is stained with oil. So what’s the cost and details for this rebuild service? Link to our online store where you can pre-order service for YOUR shocks. The load leveling system shares hydraulic fluid with the power steering system; when performing major service you would be wise to flush this fluid with new synthetic Dexron IV or compatible oil. 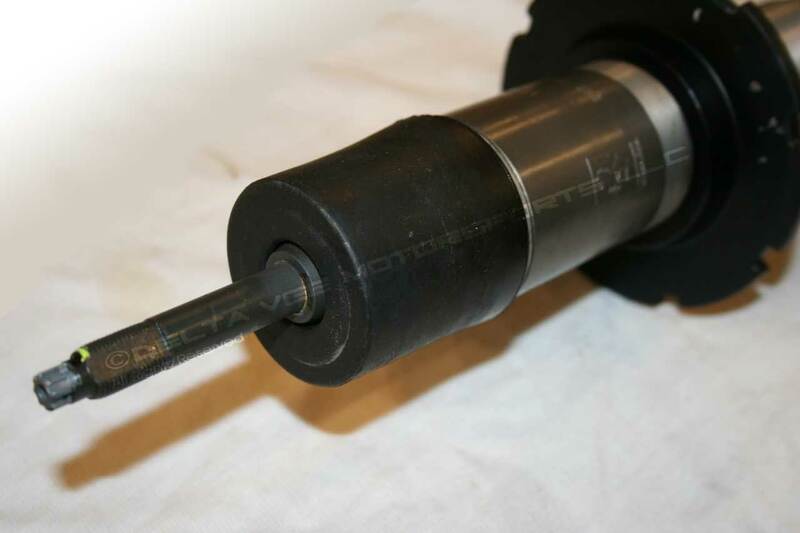 When installing the rebuilt load leveling shocks pre-fill the shock bodies with oil, loosely connect the hydraulic hose then rotate the complete assembly (spring/ damper) up into the wheelhouse with the aid of an assistant. There are bleeder screws located near the accumulators but you want oil in the dampers first vs. letting the pump fill the dampers with oil. Finally, we have a scan of the WSM pages pertinent to setting up and adjusting the ride height sensor, use our contact form to request a copy. An accurate, well-written article on a greatly misunderstood system. We recently had Delta Vee rebuild the dampers on a 456. They performed flawlessly after Rob did his magic. Thank you David for your business and kind words! “we have a scan of the WSM pages pertinent to setting up and adjusting the ride height sensor, use our contact form to request a copy”. Could you send me a copy of those pages ? I own a US 456 M GT (2001), do you sell dampers modified by you ? Thanks for your comment on our website! Attached (in an email) is the WSM pages that discuss the load level system operation and adjustment. We can rebuild your dampers, unfortunately we don’t offer them on an exchange basis. I’m in Australia, and my rear shocks are leaking on my 456. Do you still offer the rebuilding service? If you can contact me via my email that would be great, as I would like to ship them over to get done. Cheers.